How can I allow admins to choose anything from an Entity Reference field while restricting it for everyone else? I'm doing a job listings site. Users with privileges to list jobs have an Entity Reference field connecting them to a Company node. Job nodes have a similar field. So when an employer creates a Job, he should only be able to choose the Company in his own ER field. This much I can do: I just created an Entity Reference View and limited it with a Referencing Entity Relationship and a Current User filter that uses that Relationship. However, admins should be able to create Jobs for any Company. This is where I fall down. It seems like there's nothing I can do inside this View, since everything in this View has to do with the nodes being listed; there's no way to conditionally turn off a filter based on the current user. So now I need other options. I see the obvious workaround: Make the User Company field accept multiple values, and give every single one to every admin user. That will be my last resort. Before I give up and go that route, does anyone have any ideas? Any answer will do, though if yours requires my admin users to grant themselves new permissions every time we create a company, I will probably disregard it. Thanks! /* …then get rid of the view criteria that limit the choices for everyone else. Not the answer you're looking for? Browse other questions tagged views entities or ask your own question. Choose header content from entity-reference dropdown? For “parent” node, how do I show list of child nodes related by child field of type “Entity Reference”? 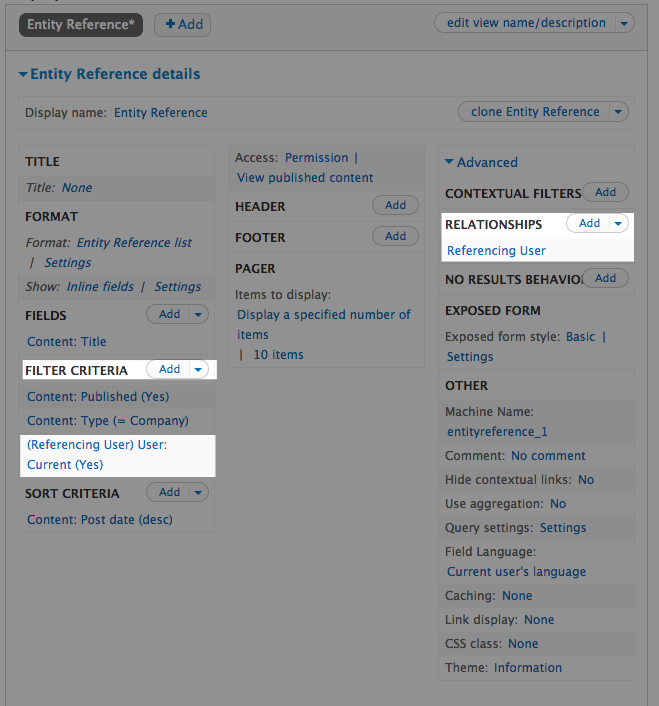 How to change the view for a “Views: Filter by an entity reference view”-mode entity reference field on the node/add or edit form? Can I use taxonomy term as relationship in view?